Dave Mannix is probably not the only person in Britain to have spent £80,000 on National Lottery scratchcards over the last 20 years. However, he may well be the only one to have spent it buying almost every single scratchcard that the National Lottery ever made. And he's definitely the only one not to have won a penny from his purchases. So why did he do it? And why might his collection eventually pay off? 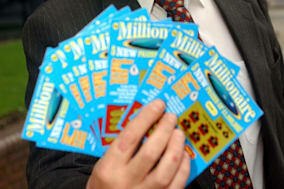 The Daily Mail reported that Mannix, a 42-year-old from Cheshire, has 100,000 scratchcards. His collection encompasses almost every card the National Lottery has ever produced - except for the 1994 Christmas scratchcard which he has never been able to track down. Around 10,000 of them have never been scratched, but the vast majority of them have expired since, so hold no value in themselves. And of the ones that have been scratched, none of them have been redeemed. He told the newspaper that he did it for the fun of collecting. However, it could prove highly fruitful. He is now selling the cards, and hopes to make £500,000. If he gets his asking price, its an impressive return. And it's not the only odd kind of collection that can fetch a surprising amount of cash. In October last year one man's collection of Star Wars memorabilia from the 1970s sold for £7,000. The highest sum was earned by a figure of Han Solo in carbonate, which went for £1,000. It helped that many of the figures were still in their original packaging. Old mobile phones are also attracting investors, and the more unusual or rare items can fetch surprising sums. A rare phone from the early 1980s can sell for £1,000 or more in the right condition. Meanwhile more common phones from the later 1980s can still be worth more than £100, and the Motorola 3300 GSM, which was the first phone to accept texts, can sell for up to £300 with the original box. In the US Starbucks gift cards are considered major collectors' items. As we reported last month a limited edition card which cost £280 and was only loaded with £250 of credit was up for sale. Just 1,000 were made, and theory were changing hands for almost $1,000 dollars on eBay. Sadly not every unusual collection will fetch good money. Sugar packet collections are known to lead fans far and wide in their quest for unusual examples, but the official organisation of sugar collectors in the UK, the UK Sucrologists Club, says it does not endorse the buying and selling of sugar packets as it wants this to be a hobby for enthusiasts. Meanwhile BT phonecards were all the rage back in the 1980s, but since they stopped producing the cards, the number of collectors have dwindled, and collectors are now lucky to get 10% of the sums these cards were worth back in their heyday.